You can set Galaxy S5 photo size and video size! As you know, your Galaxy S5 has a 16M camera. It means the Galaxy S5 camera can save photos up to 16 million pixels. When you record videos, the Galaxy S5 main camera can shoot 4K UHD (2160p) videos. These high resolution photos and videos are good when printing out in a large photo paper or watching on a UHD TV. But for most Galaxy S5 owners, it is often not necessary to save photos or videos in such high resolutions. In addition, higher resolution means larger file size. It will take longer time to transfer from phone to your PC or to cloud drive. Galaxy S5 actually allows you to set Galaxy S5 photo size and video size based on your needs. In other words, you can choose the size of each photo or video based on the usage of the photo or video. How to set Galaxy S5 photo size? 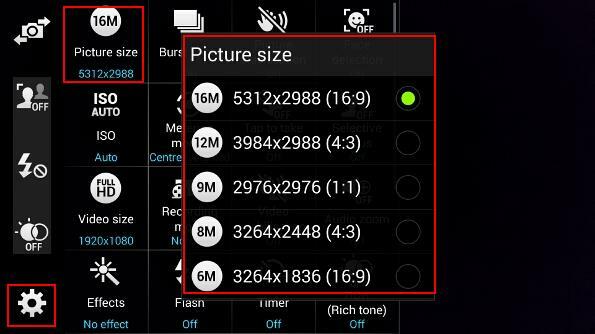 To set Galaxy S5 photo size, you can follow these steps. Step 2. Tap Settings as shown below. Step 3: Tap Picture size as show below. Step 4: Select the suitable picture size. In the picture size list, in addition to the size from 16M to 2.4M, you can choose aspect ratio of 16:9 or 4:3 (1:1 is seldom used). 16:9 photos will fill your Galaxy S5 screen exactly. In other words, there will be no black space when you view the photo on Galaxy S5. 4:3 photos are good for some old monitors, iPad, Nexus 9. If you plan to print the photo, most commonly used 4R size (6″x 4″) actually has a ration or 3:2 (which corresponds to standard 135 film). It is somewhere between 16:9 and 4:3. This means your photo will be normally cropped to fit into the 4R photo paper. Most experienced photographers prefer 4:3 in this scenario. Of course, this is arguable and you can test yourself. Please also note, the size list is quite long, you need scroll down to find all available photo sizes. For MMS or sharing through website, 2.4M is large enough. For printing in a 4R photo paper, 6M is sufficient. For printing in a A4 paper (or 8R photo paper), you should use 12M or 16M. Step 5: Tap any locations to return. The selected size will always be used unless you change it again. 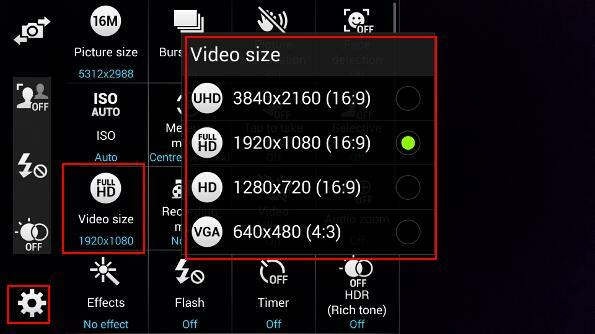 How to set Galaxy S5 video size? Similarly, you can set Galaxy S5 video size based on your needs. In Camera app, tap Settings—Video size. Then choose a suitable video size. Because most of recent TVs are in 16:9, Galaxy S5 camera use 16:9 for most sizes. Unless you have a 4K UHD TV, you should NOT choose UHD. The video quality in UHD sometimes is not so good due to hardware and software limitations. If you really need 4K UHD videos, please try to save the video the internal storage. Normal class 10 Micro SD card is not sufficient. 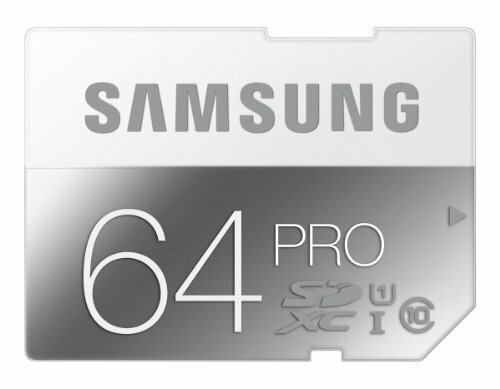 You need get a Micro SD card with writing speed higher than 60MB/s. Otherwise, you may get a terrible video. You should get at least this SanDisk Extreme Micro SD card. For most users, full HD (1920*1080) is a good option. You can save the video to a class 10 SD card with writing speed higher than 20MB/s. You may try this Samsung Micro SD card. If you mainly share the videos through MMS or website, VGA probably is a good option. How to set Galaxy S5 photo size and video size for the front camera? So far, we are only talking about the main camera (rear camera). For the front camera, you have the similar settings. But you need switch the camera to the front camera. Then tap the settings. Now you can find the picture size settings and video size settings for the front camera. Can you set Galaxy S5 photo size and video size for the main camera and front camera now? If you have any questions or encounter any problems to set Galaxy S5 photo size and video size for the main camera and front camera, please leave a comment in the comment box below.